This establishment is located in the Crystal Fens and is a short walk east of the City of Luna. 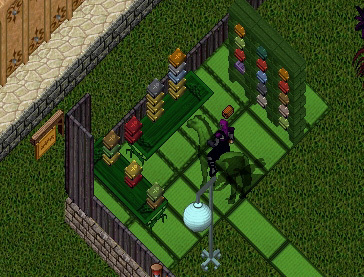 It contains a small rune library which includes a set of tmap locations. It also has a huge lockpicking box system for visitors to train with. It is sponsored and run by [Hunt], also known as The Society of Hunters Elite. As you step inside you’ll find the lockpicking box system to the right. There are chests of four different skill levels – 30, 50, 75 and GM. 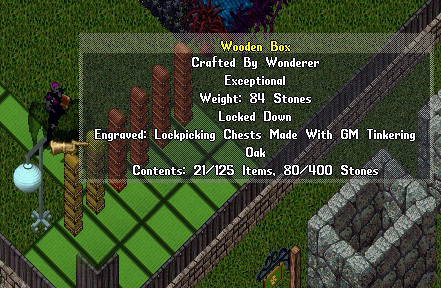 This well thought out system allows a lockpicker to gain faster with boxes that were crafted close to his skill level. To the left is their collection of runebooks. There is also a special lockpicking book near the tmap runebooks to help you with your gains. Along with the tmap locations, you’ll find various other helpful runebooks. These include runebooks to quest location, special sightseeing spots in britannia and bank roofs. If you need to contact the owners, a bulletin board is available along the outer wall. Nearby is a helpful vendor that offers runes incase you are unable to mark them yourself.